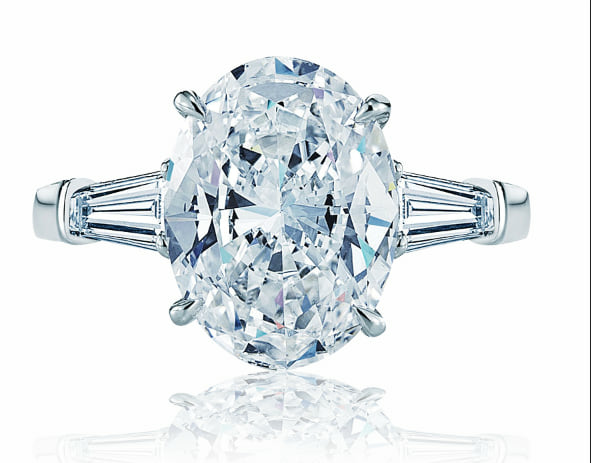 5 Carat Oval Diamond Engagement Ring. This 5 carat oval shaped diamond engagement ring is set in 18k white gold in a very modern setting. The ring is accented with micro-set round brilliant cut diamonds, and has a “halo” of diamonds set around the oval center stone. Winston’s Crown Jewelers long has been know as the purveyor of the largest and finest diamonds in Orange County. Come visit us and see the largest diamond inventory in all of Orange County. We acquire the rarest and largest of diamonds found in Orange County and have the largest diamond selection in Southern California. This ring and many like it are crafted and designed in our Newport Beach location, west of Costa Mesa and north or Laguna Beach and Corona Del Mar. If you are looking for an engagement ring that’s custom, or has a large or rare diamond in Newport Beach, Corona Del Mar, Laguna Beach, or anywhere else in Orange County- look no further.